In coming days, a major US-Iran negotiation will conclude in success or failure. The two sides are attempting to meet an agreed end-of-March deadline for the completion of an outline agreement, which is scheduled to be finalised by seven-power international agreement in June. This would allow Iran’s peaceful nuclear energy program to proceed within strict limits, in exchange for removing US-instigated international sanctions and unilateral US sanctions against Iran. President Obama and Secretary of State John Kerry want these negotiations to succeed, because they see the importance of restoring good long-term US relations with Iran, America’s only militarily effective and reliable ‘partner’ in the war against the Islamist terrorist organisation ISIL, in Syria, Iraq, and in other Middle East nations such as Libya. Israel is the de facto third – but far from silent – party to these negotiations. Prime Minister Netanyahu is adamant that Iran must be prevented from acquiring a nuclear weapons capability, which would neutralise Israel’s present nuclear weapons monopoly in the Middle East. Israel fears that if Iran could counter Israel’s nuclear deterrent, creating a regional ‘balance of terror’ of mutually assured destruction, the strategic map would change to Israel’s disadvantage. Obama and Kerry are sympathetic to the Israeli case, but only to a point. They see the wider dilemma of a Middle East wracked by endless Sunni-Shia conflict, with Syria and Iraq the cockpits of deadly ISIL sectarian/ethnic attacks on Shia Muslims, Alawites, Kurds and Christians. ISIL is secretly financed by America’s ostensible allies – the wealthy Sunni Gulf states, including Qatar, and powerful elements in Saudi Arabia. The only effective military force against ISIL’s devastating advances last year through the Sunni region of Iraq is the battle-hardened and professional Iranian army, putting steel into resurgent local Shia Iraqi militia. Those forces are now said to be on the verge of retaking Tikrit, Saddam Hussein’s birthplace and a key Sunni city. As long as the US and Iran remain opposed, the US is much less effective in working for peace and inter-communal harmony in Iraq and Syria. Israel is indifferent to these wider concerns. Netanyahu stresses that the Iranian nuclear issue is ‘existential’ for Israel. The main arguments being put by Israel and its supporters are well summarised by Australian commentator Colin Rubinstein. These views would have wide support in Israel. Hardline elements in Israel are not uncomfortable with the present tragic and bloody chaos in Syria – because it keeps the anti-Israel Assad regime weak, and its client faction Hezbollah in Lebanon neutralised. In my view, the case for Western-Iranian political rapprochement goes deeper than the present temporary alliance of strategic interests against ISIL. As Middle East states go, Iran has many pluses for the West. It is large and populous, rich, educationally and culturally advanced, and has a stable system of government. It is true that there are negatives – Iran’s heavy use of capital punishment, and human rights violations against women, homosexuals and religious minorities. But Iran has strong foundations for moving quickly to a modern state. Iran gave important quiet support to the US war against Al Qaeda in Afghanistan. There are fanatically anti-Israeli elements in Iranian politics – witness the former outspoken President Ahmadinejad. But there are also strong political forces for moderation. Over ten years, and with the removal of Western sanctions, I would expect these forces to prevail, and Iran to become a modern affluent Islamic state on lines of Turkey. The alternative would be to go on bleeding Iran with sanctions, thereby encouraging extremist anti-Western forces in Iran. Australia used to have a strong economic relationship with Iran, built around our meat and wheat exports and education links. All this well-nigh collapsed under sanctions, but could be revived. There is latent goodwill across a wide spectrum in Iran towards Australia. 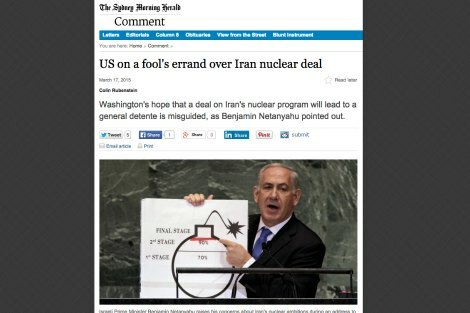 Netanyahu, invigorated by his convincing election win this week, has led a particularly vociferous campaign of public diplomacy in the US to try to derail the US-Iran deal. His speech in the US Congress on 3 March moved a large group of Republican Senators to send an unprecedented letter to the Iranian Government, warning that if a Republican were elected to the presidency in 2016, he would not be bound by any deal with Iran negotiated now by Obama under his presidential powers. In response, the Obama administration is said to be working with other permanent Security Council members on a UNSC resolution lifting UN sanctions soon after a US-Iran accord is reached. Obama and Kerry are sticking to their plan. Their objective in these final days of negotiation with Iran is to increase to one year the time it would take for Iran to develop enough weapons-grade material, under a resumed internationally approved peaceful nuclear energy program, to build a nuclear weapon if Iran should decide to break out of an accord. These provisions to ensure a one-year ‘break-out’ time would be in effect for at least the first 10 years of what is expected to be a 15-year agreement, US officials say. Iran has indicated it could live with this and is hopeful that agreement is close. The final days of negotiations will be highly technical and quantitative, involving top nuclear physicists on both sides. Australia has an interest in these talks succeeding. Last year Iranian Supreme Leader Ayatolla Ali Khamenci posted on his Twitter account a plan titled “9 key questions about the elimination of Israel” and said Israel “has no cure but to be annihilated.” Yet the Obama administration, and Tony Kevin, believes in accommodating a nuclear Iran. Indeed, the Obama administration’s assessment of Iran’s intentions is so positive that a just-released Threat Assessment report of the director of National Intelligence makes no mention of Iran’s support for terrorism, in contrast to prior annual reports, and suggests that Iran’s primary motivation is to be a good neighbour. As one observer noted “Neville Chamberlain never said such nice things about Hitler.” Few allies now trust the Obama administration. Egyptians remember its support for the Muslim Brotherhood (allied with Hamas which aims to destroy Israel) and deposed President Mohamed Morsi; Ali Khedery who was the longest continuously serving American official in Iraq said that the Obama administration “betrayed the promises that the U.S. government had made to the Sunni tribal leaders” who had previously fought with American troops; and even the UK and Australia may join China’s new Investment Bank against the wishes of Washington, something unthinkable a few years ago. The "MY WAY or WAR", attitude is usually found in infants. And spoilt ones at that. But it does linger on in some adults. Of course it can be provoked, even in adults, by what is seen as unjust aggression. - Even it the aggression was instigated by dispossession of long-standing traditional lands, and exacerbated by ongoing settlement on land that is (at least) disputed. I have long been concerned about the way Israel obtained its nuclear arsenal. It is hypocritical for Israel to object to any other country obtaining nuclear weapons by more legal ways than the ones Israel used. In the end we'll all be dead but in the meantime governments of all stripes should strive to see that we are not war dead. Of course they don't strive for this. That's why I think the members of the Israel Peace Movement are the bravest citizens in the Middle East. Talk about a voice crying in the wilderness. Western media coverage of Israeli politics gives us no idea of the political forces at work in Israel against the war mongering of Netanyahu. His Likud Party is the Tea Party of Israel - impossible to negotiate with. Seen from outside the current situation in the Middle East seems a bubbling Witch's Brew. Most political actors are morally compromised and untrustworthy. Any Western diplomacy in the region needs to be handled by those who are extremely street savvy about the area and the duplicity of most major players. I will be watching very carefully to see how the Iraqi Army, its Iranian allies in the Revolutionary Guard and the Shi'ite militia behave if there is a major Isis/Da'esh defeat at Tikrit. A massacre of Sunnis - any Sunnis - will cause alarm in Saudi Arabia and the Gulf as well as the rest of the Sunni world. The consequences of this are unpredictable. A major Sunni-Shia war is one. Any increase in Iranian power in Iraq would make the situation with Israel even more volatile. If the world can accommodate a nuclear Israel and Pakistan, not to mention China, US, UK, Russia and France, it can accommodate a nuclear Iran.